Luxury resale has never been chicer than it is right now. And while selling or purchasing pre-owned wares can seem daunting (Where do I start? Is it real? Is it good quality? ), there is no shortage of companies who help make the task easier. Enter Vestiaire Collective—with a curated catalogue of covetable items, Vestiaire Collective has cemented its presence in the consignment sector. With strict quality control, you can rest assured knowing your purchase has been handled by a team of experts, guaranteeing authenticity and ensuring you get exactly what you had your stylish eye on. We chatted with Fanny Moizant, Vestiaire Collective’s Co-Founder, to talk all things consignment, how Vestiaire Collective stands apart, and how to be smart when buying or selling pre-owned. Vestiaire Collective recently underwent a rebrand. Tell us about the company’s goals with this rebrand. FANNY MOIZANT: Resale isn’t something new and it’s no longer niche, so we want to educate people that resale is chic and doesn’t have to be the “second-hand” that you are familiar with. We also want to introduce people who don’t have access to luxury products to resale as the new way to shop luxury. You’ve partnered with Anna Dello Russo on the fourth instalment of the Archive Series. What is The Archive Series? FM: When I speak to people they always tell me how they find pieces from previous seasons that they missed out on through the website and they’re so happy that they finally tracked them down! The pieces that are rare but super coveted. We launched the Archive Series to go inside the archive of people that loved and collected fashion and ask them to pull a selection to sell to the community on Vestiaire. We’ve had incredible pieces, one-off couture pieces, super rare, runway samples—we’ve uncovered the most incredible pieces through this series. 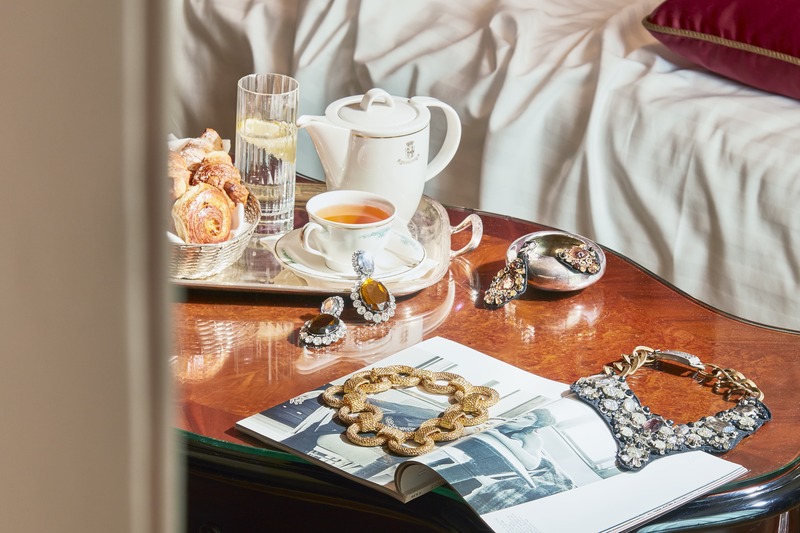 What are some of the highlights of the collaboration with Dello Russo? FM: Anna is the original street style icon; she really knows how to finish a look. She has the most amazing jewelry collection and we persuaded her to sell a selection of pieces with us. Each piece is really statement in its own way—I love the Lanvin chunky gold chain. Each piece is very Anna and you can totally imagine her wearing it. The good thing is that the pieces can also be dressed down so you don’t necessarily need to be a street style star! A look at items from the Anna Dello Russo Archive Series sale. What is the most over-the-top item that Vestiaire Collective has consigned? FM: We’ve had some incredibly rare pieces on the site, including the Chanel Bible clutch which is a super rare collector’s piece. We’ve have an incredible yellow diamond ring on the site—it’s 10.5 carats and the yellow of the diamond is really intense, it really does sparkle. It’s a super rare piece which reflects the price of more than a million dollars. Which luxury brands have the highest resale value, and what is it about those brands that makes them unique? FM: Hermès, Chanel and Louis Vuitton have a high resale value, especially when it comes to the classic pieces. The Kelly, 2.55, and Speedy bags all have a high resale value. These pieces never go out of fashion—they are classic that you will be wearing for years to come. The consignment business has grown tremendously in recent years. What is your advice to consumers looking to consign? FM: For trend items, you will be able to recoup the majority of the original retail price if you sell within the same season of purchase. Overall an item’s desirability decreases significantly after 2 to 3 seasons from release, with the exception of a small number of collector’s pieces. The arrival or departure of a creative director will also impact on the interest in a brand and therefore tends to increase the resale value of current, previous and upcoming collections. Always include as much detail on the item as possible, including any marks. Take the photos in good light and include images from all angles so the buyer has a full view of the item. What about those looking to purchase from Vestiaire Collective? What are some of your top tips? FM: Look at three things when investing: Good craftsmanship is key and gives an item longevity in the marketplace. Durability—items with a high level of buzz around them retain higher resale value whilst they are still hot. And rarity—limited availability of a brand or specific product increases desirability within the resale market. To explore Vestiaire Collective’s extensive selection of luxury pre-owned items, visit us.vestiairecollective.com. Shop Anna Dello Russo’s Archive Series from today, while supplies last.